So in going through my fabric stash I noticed a lot of little scraps left over from Sam's quilt... to small for any significant project but the perfect size for trying hexies for the first time. Hexies made while on the bus, while Sam's sleeping, before my shift at work, on my break, when ever I had two free minutes I was making hexies. And with no clear plan of action for the hexies I just kept going. 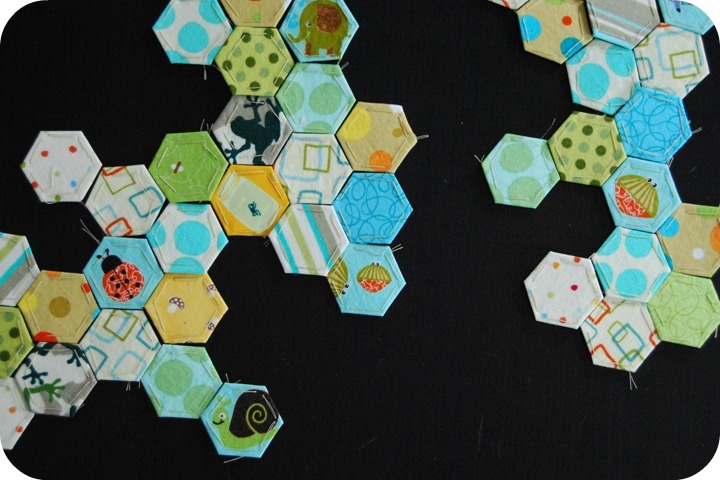 I would arrange and rearrange them in different patterns over and over again, while still wondering "what am i going to do with all these hexies?" I'll make Sam a pillow to go with his quilt! 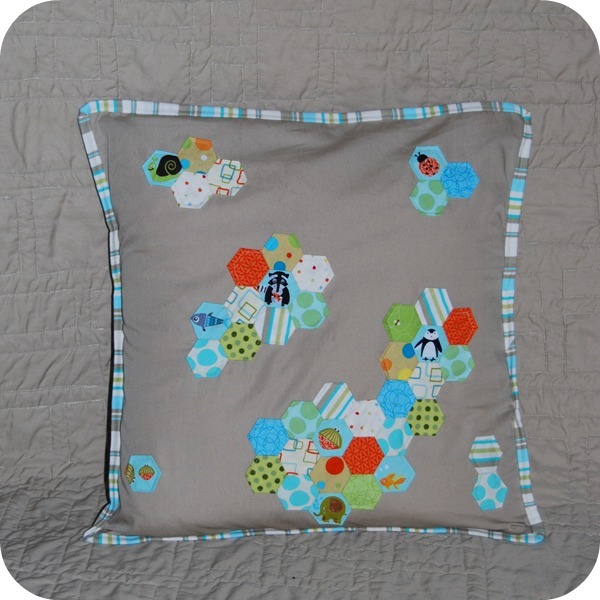 And enter it in the Bloggers Pillow Party! 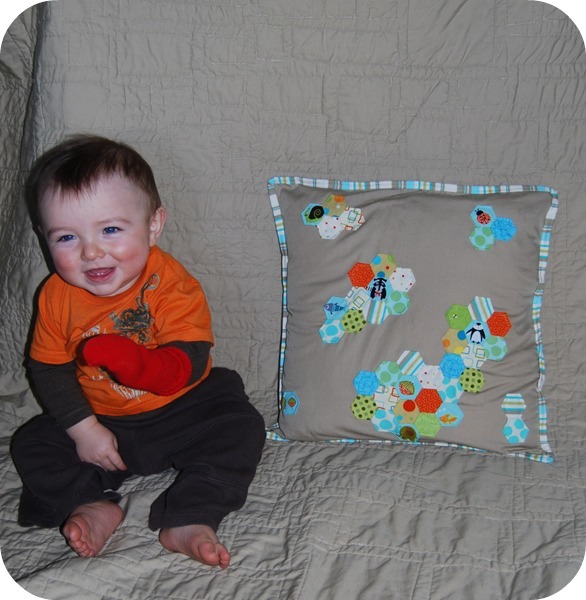 So what if I've never made a pillow before, how hard can it be? It's just two squares sewn together... right? I now ask myself "How many times will I say that before starting a new project?" So despite the fact that not all my seams are perfectly aligned, the pillow form inside is definitely not fitting properly, and I'm still learning the fine art of binding, I'm pretty happy with it. I might go back later and do a bit of hand stitching around the hexies or maybe I'll leave it as is...we'll see. 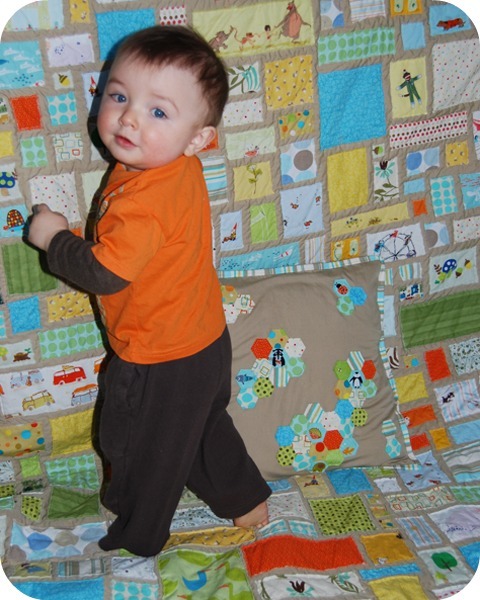 It looks pretty good with Sam's quilt, though I wish I had some Heather Ross scraps left over to mix in. This won't be my last hexie project, nor will it be my last pillow project, and while it would be nice to win... (mmmm, sherbet pips, oh how i love thee) I think all that really matters is what my little Sammy thinks.